Doctor Who: The Moffat Scripts - THE RETURN OF DOCTOR MYSTERIO | Warped Factor - Words in the Key of Geek. Dr. Moo is faster than a speeding bullet. After a year of no new Doctor Who material on TV (What’s that? Class? Don’t make me laugh.) it was always going to be difficult to make the return of the series land. Add to this the fact that this was a Doctor Who episode with superheroes. That’s not a combination that should work. Ever. This idea shouldn’t have got the go-ahead, someone really should’ve had a word with Moffat when he first voiced the idea. 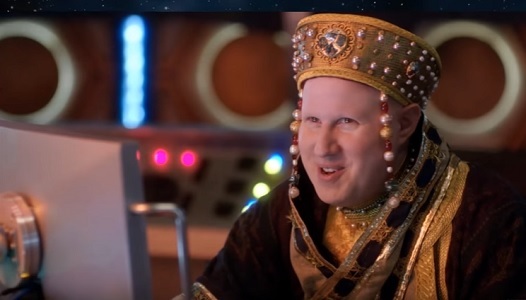 Then they went and revealed that Nardole, played by Matt Lucas, was going to come back for no reason other than that Lucas had asked Steven Moffat to bring him back because he’d enjoyed filming the previous Christmas special. He was fun enough, but I doubt anyone was especially keen for more. The elephant in the room. Pictured holding a cuddly toy. Let’s not beat around the bush. On paper, The Return Of Doctor Mysterio was never going to work. And there are definitely problems with the final product. There are some flimsy moments in the plot for one thing. Why does Grant still call a woman he’s known since they were children “Mrs Lombard”? The only reason is so there can be an extremely obvious twist with regards to who she is. And the villainous scheme by returning foes The Shoal Of Winter Harmony to destroy the world’s capital cities and wait for world leaders to come running to them is laughably absurd. The way this plot is defeated feels a little bit too easy as well, not to mention overly convenient. And that’s before we mention how some of the effects look ropey. They were always going to – it’s the BBC for goodness sake – but because this is an episode that takes on the genre tropes of some of the biggest blockbusters in the world right now so it stands out all the more. The way that Grant gets his superpowers also comes off a bit “because of plot” for my liking. He swallows an alien gemstone, which gives him his wish to have superpowers like his comic book heroes, but he seems about three years too old to realistically convince me that he might actually swallow it. All of these issues need saying up front before I move on, because I can’t not mention them. So with these put on the table, let’s get to the real points I want to say about The Return Of Doctor Mysterio. It is one of the most beautiful, charming, and entertaining episode of Doctor Who that this series has ever broadcast. That probably comes in part from the obvious inspirations for it. Moffat made no secret of how he was riffing on the genre conventions of the 70s Superman movies starring Christopher Reeve and it really shows. From the alliterative naming (Grant Gordon, Lucy Lombard) to the scenes from the movies lifted wholesale. We have, for example, a scene where journalist Lucy has an interview with superhero The Ghost, not realising that the hero’s true identity is someone she’s known in real life for years, almost identical to a sequence from the first Reeve movie. He then has to make excuses to switch between both identities in order to avoid revealing the truth to her, which is plucked right out of Superman IV’s only halfway decent moment. The villains too feel like any number of superhero nemesis. The Harmony Shoal planning to remove people’s brains and take them over could as easily be put into a Superman story as it is a Doctor Who one. And that’s why this episode works: It’s a superhero adventure told from the perspective of a Doctor Who story. Peter Capaldi's Twelfth Doctor is still a joy to spend time with but this isn’t his story. He’s just along for the ride, having fun, and letting himself loose. 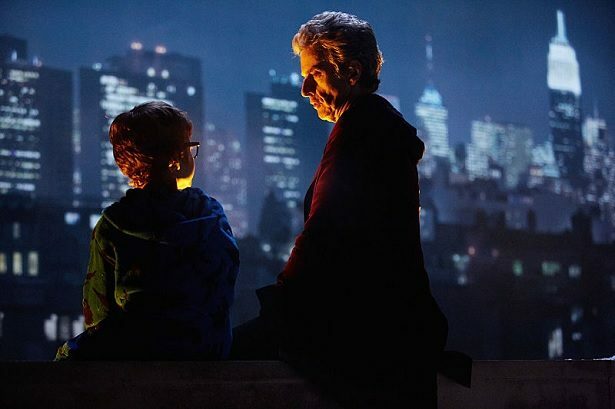 He and Nardole don’t need to be in this story, but they are anyway and we see the Doctor caught up in a superhero adventure. He gives Grant/Ghost advice and confronts the villains a few times but he never influences the plot. But I’m fine with that. It’s not a criticism because it allows us to witness a traditional superhero adventure from a completely different point of view. 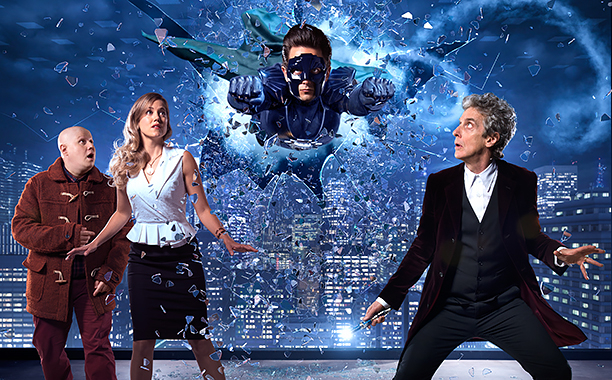 Justin Chatwin and Charity Wakefield are as much the leads as Peter Capaldi and Matt Lucas are. Speaking of, Lucas is wonderful here. He gets to add some more nuance than he did before, especially the final sign-off, whilst still showing off his comedic strengths by wisecracking one-liners and some subtle background gags. 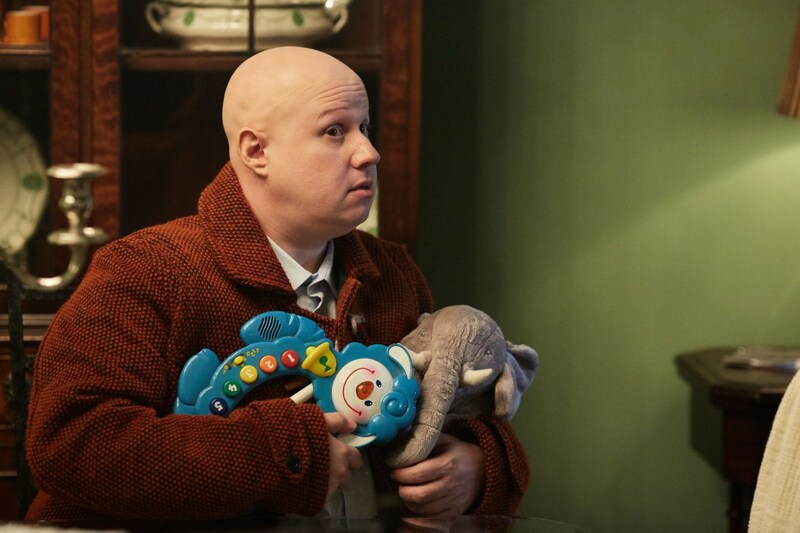 It’s safe to say that Nardole’s return was an unwelcome surprise. But any doubt is silenced by what he brings to the table here. Really that sums up the episode perfectly. Everyone went into The Return Of Doctor Mysterio with low expectations, these were exceeded. More than that, it ended up being one of the most delightful and fun episodes ever made. Is this the best episode of Doctor Who ever? Not even close. But for an hour of fun festive entertainment you really couldn’t ask for more.